CD review: "Spirit of the Moment: Live at the Village Vanguard"
This review first appeared in the November 3, 1995 issue of the North County Blade-Citizen (now North County Times). 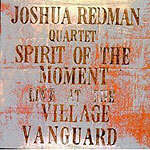 Young saxophone phenom Joshua Redman continues his amazing artistic growth on his latest release. His first live set, a double-CD album from the Village Vanguard, shows him to be even better in front of an audience than he's been so far in a studio. While it's far too early to categorize Redman as one of jazz's all-time greats, he is developing a highly individual and easily recognized sound on his horn  one of the hallmarks of a top-rank jazz artist. His sweet, fat tone and nimble lines quickly give him away; his increasingly rich and complex compositions also have a consistency that mark them as Redman's.